Celebrating Lives – a 'peace' of my mind…. On Wednesday nights we used to sit in the den together for as long as we could after supper to watch the beginning of Batman. It came on at seven o’clock and we could usually watch long enough to see if the Penguin or the Joker was going to be that episode’s villain before my mother started hollering to get ready for church. We didn’t do this very often, but when we went to the store by ourselves I always got to get a package of Chiclets gum. The miniature pieces, just like big Chiclets, were tiny and all different colors, and you could see them through the cellophane window on the bright yellow package. I still like to dump a whole gob of ‘em in my mouth at once. The flavor doesn’t last very long, but it turns your tongue a psychedelic shade of purple. To this day when I eat vanilla ice cream and chocolate syrup, I still save the last few bites to swirl together into this melted, chocolaty mush. I drink saccharin in my coffee. I could eat my weight in pizza with everything on it. So could he. And there’s no better meal than red beans and cornbread with fried potatoes and tomato slices and green onions. That’s my father’s favorite meal, so my mother fixed it a lot when I was growing up. It’s one of my favorite meals, too. He still prepares my tax return every year because I don’t like to do it. He still asks me when I’ve had the oil changed in my car. Every time he comes to my house he finds chores to do. And he lets the milk set on his cereal and turn to mush before he’ll eat it. I guess we’re different in some ways. But there’s quite a bit of my dad in me. We've always made a big deal about birthdays in my family. Taking one day out of the year to say, I'm really glad God put you here on this earth - and in my life. 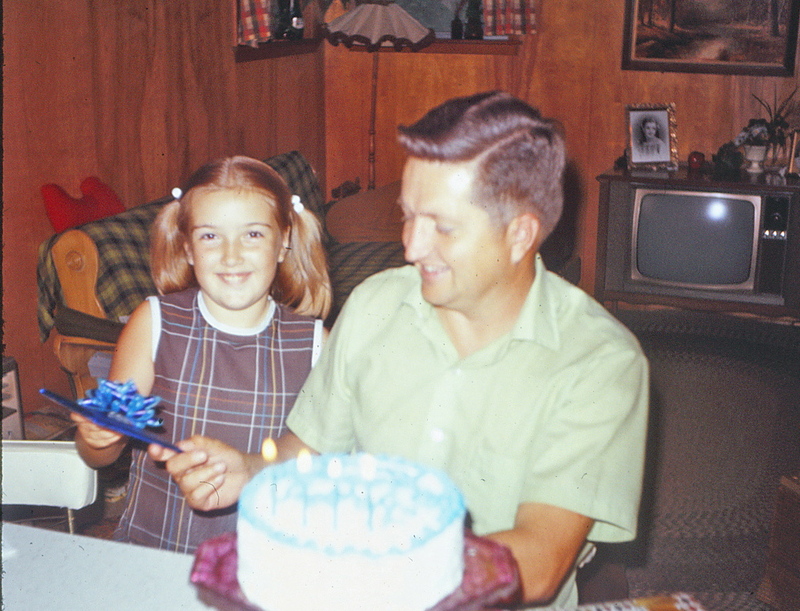 Today is no different, and we'll celebrate with a steak at Perini's tonight.Happy Birthday, Daddy! Next Post Don’t Give Up On Tomatoes. Or Anything Else…. How beautiful that after all you’ve worked thru as a family, you have sweet, fun memories. Encourages me to look for good. So many sweet memories of a precious family – so thankful for that. Happy Birthday Dan! I love you and Betty very much and have fond memories of spending time together. Sally please let your dad know I am sending birthday wishes his way. Have a wonderful time together! Will do – thanks, Tracy! Thanks, Sally, for remembering your dad like this. Brings back memories, many things I didn’t care much about at the time, but things I reference all the time these days…At her request, we did Perini’s Monday night for Lauren’s 27th. Enjoy! We will – thanks, Ed! I really loved reading this today. It did my heart good! Thanks, sweet friend – mine, too! Happy Birthday, Dan! Enjoy your steak and your time together tonight! Thanks, Lisa – I’ll pass on the birthday wishes when they get here this afternoon!